There is unknown number of tests. 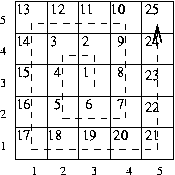 Each of them consists of one line in which appear two integers: n (0<n<=106; n always odd) - size of the square matrix and m (0<m<=n2) - the number of the choosen cell. For each test print index of the row and index of the column of the choosen cell which is determined by m.
Yeah, but it's kind of unfair for other users who may have a valid solution which would be shorter then valid equivalent of the best current one. I know it's also unfair to change the problem now but I think it's a better solution. Apologies. I've already done this with other tasks so it should happen with this one as well. Thanks for informing. Will fix it in Feb.
there are some missing tests which my 75/76 awk code fails,e.g. 3 9. Now there are only 25 tests. When I changed time limit into 30sec only one of Your submissions get AC. Maybe not the biggest but one of the biggest.